I Blog Anime: 07-Ghost: Chain Fetish? It's been four episodes since he escaped, and at least three day and nights within the story, does anybody there just not seeing the cuffs and chains on him? Nobody around him said anything about them nor has anybody offered any help on trying to take them off. As for him, it seems that he doesn't really care about he's still with cuffs and chains nor do they seem to cause him any discomfort. What's up with these people?! One would think the Bishops would have removed those first... But no, lets let the kid wonder around with them on. They don't seem to be limiting his power or anything, and he seems perfectly fine at jumping around on the sides of buildings with them, so I dunno, maybe there is in-deed some BSDM going on. my theory is that when the head military guy put them on him, maybe his ziphon is the only one which can act like a "key" and therefor they act like conventional handcuffs in that respect. maybe. 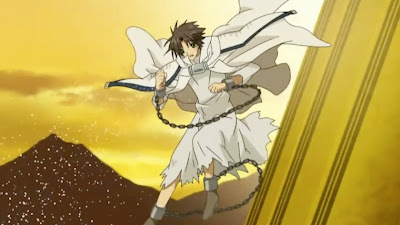 I think the chains are symbolic for his trapped potential. Once you know who dies, those chains will come off. I really hate how in 07 Ghost, I like some of the villians more than some of the main characters. Symbolic or not, simply leaving it there without any explanation what so ever just bothers me. And...what do you mean by "like"? The image or the character? I'm not impressed by this anime at all. But I don't understand why it's so far up on the poll. In my opinion, it shouldn't even be in the top 10 from the season.